During an orientation session conducted by Mr. Vipul – Higher Education Field coordinator, with students and school teachers at Vyankatesh Vidyaniketan School in Vikhroli, Payal was introduced to Mumbai Smiles Foundation and its scholarship project. Payal, a bright student currently pursuing commerce in S.K Somaiya Jr. College aspires to become a Charted Accountant. Intrigued by the work Mumbai Smiles does in providing financial support to needy and hardworking students, Payal attended the goal setting and career guidance sessions. 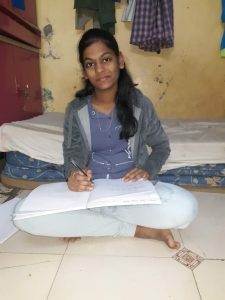 Mumbai Smiles guided her on scholarships available for pursuing higher academic studies, and also helped her develop soft skills through capacity building sessions. The life skills session helped Payal manage time and deal with stress. As a recipient of the scholarship Payal’s confidence has increased tremendously. We couldn’t be more proud of her growth. We have complete faith in Payal’s academy excellence!